We will also consider applicants in other focus areas of the lab, including information retrieval, and behavioral & empirical economics. Additional information about these areas is included below. Please submit all application materials by January 11, 2013 for full consideration. Instructions are here. With an increasing amount of data on every aspect of our daily activities — from what we buy, to where we travel, to who we know — we are able to measure human behavior with precision largely thought impossible just a decade ago. Lying at the intersection of computer science, statistics and the social sciences, the emerging field of computational social science uses large-scale demographic, behavioral and network data to address longstanding questions in sociology, economics, politics, and beyond. We seek postdoc applicants with a diverse set of skills, including experience with large-scale data, scalable statistical and machine learning methods, and knowledge of a substantive social science field, such as sociology, economics, psychology, political science, or marketing. Online experimental social science involves using the web, including crowdsourcing platforms such as Amazon’s Mechanical Turk, to study human behavior in “virtual lab” environments. Among other topics, virtual labs have been used to study the relationship between financial incentives and performance, the honesty of online workers, advertising impact as a function of exposure time, the implicit cost of “bad ads,” the testing of graphical user interfaces eliciting probabilistic information and also the relationship between network structure and social dynamics, related to social phenomena such as cooperation, learning, and collective problem solving. We seek postdoc applicants with a diverse mix of skills, including awareness of the theoretical and experimental social science literature, and experience with experimental design, as well as demonstrated statistical modeling and programming expertise. Specific experience running experiments on Amazon’s Mechanical Turk or related crowdsourcing websites, as well as managing virtual participant pools is also desirable, as is evidence of UI design ability. Market design, the engineering arm of economics, benefits from an understanding of computation: complexity, algorithms, engineering practice, and data. Conversely, computer science in a networked world benefits from a solid foundation in economics: incentives and game theory. Scientists with hybrid expertise are crucial as social systems of all types move to electronic platforms, as people increasingly rely on programmatic trading aids, as market designers rely more on equilibrium simulations, and as optimization and machine learning algorithms become part of the inner loop of social and economic mechanisms. We seek applicants who embody a diverse mix of skills, including a background in computer science (e.g., artificial intelligence or theory) or related field, and knowledge of the theoretical and experimental economics literature. Experience building prototype systems, and a comfort level with modern programming paradigms (e.g., web programming and map-reduce) are also desirable. Machine learning is the discipline of designing efficient algorithms for making accurate predictions and optimal decisions in the face of uncertainty. It combines tools and techniques from computer science, signal processing, statistics and optimization. Microsoft offers a unique opportunity to work with extremely diverse data sources, both big and small, while also offering a very stimulating environment for cutting-edge theoretical research. We seek postdoc applicants who have demonstrated ability to do independent research, have a strong publication record at top research venues and thrive in a multidisciplinary environment. We were there to promote The Signal, a partnership between Yahoo! Research and Yahoo! News to put a quantitative lens on the election and beyond. The Signal was our data-driven antidote to two media extremes: the pundits who commit to statements without evidence; and some journalists who, in the name of balance, commit to nothing. As MIT Tech Review billed it, The Signal would be the “mother of all political prediction engines”. We like to joke that that quote undersold us: our aim was to be the mother of all prediction engines, period. The Signal was a broad project with many moving parts, featuring predictions, social media analysis, infographics, interactives, polls, and games. Led by David “Force-of-Nature” Rothschild, myself, and Chris Wilson, the full cast included over 30 researchers, engineers, and news editors . We confirmed quickly that there’s a clear thirst for numeracy in news reporting: The Signal grew in 4 months to 2 million unique users per month . On that night, though, the journalists kept coming back to the Yahoo! PR hook that brought them in the door: our insanely early election “call”. At that time in February, Romney hadn’t even been nominated. No, we didn’t call the election, we predicted the election. That may sound like the same thing but, in scientific terms, there is a world of difference. We estimated the most likely outcome – Obama would win 303 Electoral College votes, more than enough to return him to the White House — and assigned a probability to it. Of less than one. Implying a probability of more than zero of being wrong. But that nuance is hard to explain to journalists and the public, and not nearly as exciting. Although most of our predictions were based on markets and polls, the “303” prediction was not: it was a statistical model trained on historical data of past elections, authored by economists Patrick Hummel and David Rothschild. It doesn’t even care about the identities of the candidates. I have to give Yahoo! enormous credit. It took a lot of guts to put faith in some number-crunching eggheads in their Research division and go to press with their conclusions. On February 16, Yahoo! went further. They put the 303 prediction front and center, literally, as an “Exclusive” banner item on Yahoo.com, a place that 300 million people call home every month. The firestorm was immediate and monstrous. Nearly a million people read the article and almost 40,000 left comments. Writing for Yahoo! News, I had grown used to the barrage of comments and emails, some comic, irrelevant, or snarky; others hateful or alert-the-FBI scary. But nothing could prepare us for that day. Responses ranged from skeptical to utterly outraged, mostly from people who read the headline or reactions but not the article itself. How dare Yahoo! call the election this far out?! (We didn’t.) Yahoo! is a mouthpiece for Obama! (The model is transparent and published: take it for what it’s worth.) 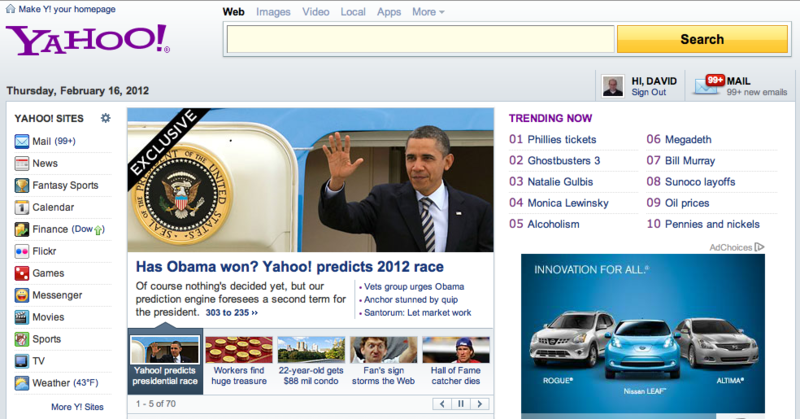 Even Yahoo! News editor Chris Suellentrop grew uncomfortable, especially with the spin from Homepage (“Has Obama won?”) and PR (see “call” versus “predict”), keeping a tighter rein on us from then on. Plenty of other outlets “got it” and reported on it for what it was – a prediction with a solid scientific basis, and a margin for error. This morning, with Florida still undecided, Obama had secured exactly 303 Electoral College votes. Just today Obama wrapped up Florida too, giving him 29 more EVs than we predicted. Still, Florida was the closest vote in the nation, and for all 50 other entities — 49 states plus Washington D.C. — we predicted the correct outcome back in February. The model was not 100% confident about every state of course, formally expecting to get 6.8 wrong, and rating Florida the most likely state to flip from red to blue. The Hummel-Rothschild model, based only on a handful of variables like approval rating and second-quarter economic trends, completely ignored everything else of note, including money, debates, bail outs, binders, third-quarter numbers, and more than 47% of all surreptitious recordings. Yet it came within 74,000 votes of sweeping the board. Think about that the next time you hear an “obvious” explanation for why Obama won (his data was biggi-er!) or why Romney failed (too much fundraising!). 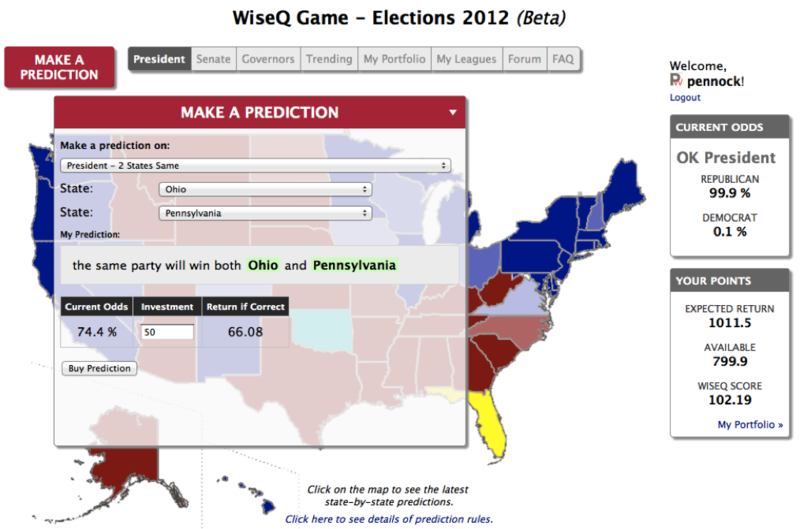 Kudos to Nate Silver, Simon Jackman, Drew Linzer, and Sam Wang for predicting all 51 states correctly on election eve. As Felix Salmon said, “The dominant narrative, the day after the presidential election, is the triumph of the quants.” Mashable’s Chris Taylor remarked, “here is the absolute, undoubted winner of this election: Nate Silver and his running mate, big data.” ReadWrite declared, “This is about the triumph of machines and software over gut instinct. The age of voodoo is over.” The new news quants “bring their own data” and represent a refreshing trend in media toward accountability at least, if not total objectivity, away from rhetoric and anecdote. We need more people like them. Whether you agree or not, their kind — our kind — will proliferate. Congrats to David, Patrick, Chris, Yahoo! News, and the entire Signal team for going out on a limb, taking significant heat for it, and correctly predicting 50 out of 51 states and an Obama victory nearly nine months prior to the election. The extended Signal cast included Kim Farrell, Kim Capps-Tanaka, Sebastien Lahaie, Miro Dudik, Patrick Hummel, Alex Jaimes, Ingemar Weber, Ana-Maria Popescu, Peter Mika, Rob Barrett, Thomas Kelly, Chris Suellentrop, Hillary Frey, EJ Lao, Steve Enders, Grant Wong, Paula McMahon, Shirish Anand, Laura Davis, Mridul Muralidharan, Navneet Nair, Arun Kumar, Shrikant Naidu, and Sudar Muthu. Although I continue to be amazed at how greener the grass is at Microsoft compared to Yahoo!, my one significant regret is not being able to see The Signal project through to its natural conclusion. Although The Signal blog was by no means the sole product of the project, it was certainly the hub. In the end, I wrote 22 articles and David Rothschild at least three times that many. My blog has been hacked yet again. For those keeping track, that’s infection number three. This latest exploit is very similar to the previous one. To humans arriving via browser (e.g., me), the site appears perfectly normal and healthy. Even upon clicking ‘view source’, nothing untoward is revealed. The <title> of my blog is, as always, Oddhead Blog. However, when Google’s or Bing’s crawlers arrive to index my corner of the web, they see a different <title> altogether — Buy Cheap Cialis Online — and immediately roll their eyes. (Actually even if you run 'curl http://blog.oddhead.com', you’ll see the spam keywords.) The effect of the attack is a kind of reverse cloaking. Cloaking is the black-hat SEO practice of serving legitimate content to crawlers and spam content to people. Here, the spam content is shown to the crawlers and the legitimate content to the people. Once again I am at a loss to understand my attacker’s motivation. Clearly it’s not to sell Cialis to my users, as they remain blissfully ignorant of any changes. The only benefit to anyone is to remove one relatively obscure blog from the search engine rankings and thus to move the attacker one slot up. Having a blog tangentially about gambling probably puts me into a shady neighborhood of the web, yet reverse-cloaking your competition (even if it can be somewhat automated and strike more than one competitor) seems like an awfully indirect way to improve one’s standing in Google. It’s also possible this is an act of pure vandalism. So what should I do? Although I partly blame WordPress for writing insecure software, I may end up paying WordPress protection money to make this problem go away. I am seriously considering giving up on self hosting and moving my whole operation to worpress.com’s hosted service, where presumably security is tighter, or at least it’s not my responsibility any more. My web hosting service, DreamHost, may also be partly to blame, yet I like the company and have been quite happy with them in many respects. Any advice, dear reader? WordPress.com? Blogger? Try again and hope the fourth time is the charm? Should I be looking to ditch DreamHost as well? 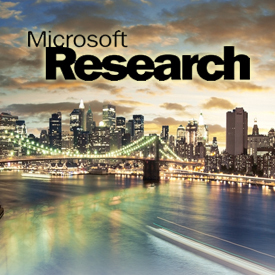 Now that I’ve said my goodbyes, I’m thrilled to announce that I’ve joined Microsoft Research, an organization with going-on twenty-one years of commitment to basic and applied research, employing 850 Ph.D. scientists around the globe including Turing Award winners, Fields Medalists, and many long-time colleagues that I hugely respect. If that were all, I would be over-the-top happy right now. But that’s not all. Together with fourteen other founding members (seven of whom I can name: Duncan Watts, John Langford, David Rothschild, Sharad Goel, Dan Goldstein, Jake Hofman, and Sid Suri), we are cutting the ribbon on a new outpost for Microsoft Research in New York City. We will report to Jennifer Chayes, the founder and director of Microsoft Research New England in Cambridge, MA. It’s been amazing to watch her up close pursue a goal relentlessly with boundless positive energy. I get the feeling it’s how she approaches everything she does, a realization that played no small part in my decision. The New England Lab, like us, is an interdisciplinary research group that blends computer science, social science, and machine learning, yet from different enough perspectives to make this an almost perfect marriage. It’s no exaggeration to say that helping to found and lead a new research group amid the bursting tech scene in New York City, with the resources of Microsoft behind us, is — as Duncan says — a once-in-a-career opportunity. The press coverage Thursday was gratifying, including nice pieces in PCMag (source of the sweet logo above), NYTimes.com, AllThingsD, and dozens more. Here is the official press release. For science perspectives, see John Langford’s, Lance Fortnow’s, Dan Goldstein’s, and Jennifer Chayes’s blog posts. One of the coolest moments came when New York Mayor Michael Bloomberg tweeted about us. Note that, despite the attrition, Yahoo! Labs lives on, probably more applied but not solely so. Ron Brachman, the new head of Yahoo! Labs, is terrific and may be able to do something special there. The Barcelona group remains largely intact and just got 7 (!) papers into SIGIR. Other groups remain intact as well. The reception within Microsoft research and product orgs has been swift and very warm. The breadth and scope of the place can be daunting at first but invigorating. The ability to impact products that touch hundreds of millions of people’s lives is, as always, a rewarding draw of corporate research. Yet one of the deciding factors for many of us in joining Microsoft is the freedom to interact with universities in research, service, teaching, hosting visitors, hiring interns and postdocs, etc. In addition, we’d like to play our part in the New York City tech scene, including the startup, venture-capitalist, and hack/make communities, plus the new Cornell-Technion campus, contributing to Mayor Bloomberg’s vision of New York City as a tech hub. An interesting side note that bodes well for my two daughters ages 7 and 4 is that my primary decision boiled down to working for one of two brilliant and accomplished women: Jennifer Chayes at Microsoft, or Corinna Cortes at Google, who is absolutely terrific. Google is a incredible place, a model of efficiency, innovation, and ambition, with an impressive roster of people, and the company is in a very strong position. But this opportunity at Microsoft simply proved to be too good to pass up. I can’t believe how perfectly everything fell into place. I’m beyond thrilled at the outcome and excited to begin this next chapter of my career. 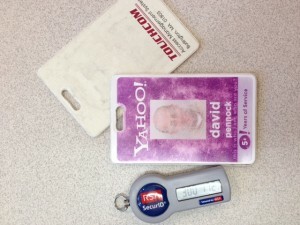 On Thursday April 26, 2012, I resigned from Yahoo! after nearly 10 without actively changing jobs. Here is the full text of the goodbye letter(s) I sent. It’s the kind of long-winded last salvo that few people actually read, and now I’m foisting it upon you, dear reader, but I can’t help myself. Writing it brought back many wonderful memories and a tinge of sadness at the end of a truly amazing work environment for me, but I found the exercise rewarding. I really appreciate the many kind words and well wishes: some were poignant and immensely gratifying. The feeling is mutual. If nothing else, throughout my career I have had the great fortune of working with amazing people who are equal parts brilliant, effective, and nice, including my bosses, peers, reports, and students. gave up their tenure to stay at Yahoo!. exciting and successful group I’ve seen crossing the CS/Econ boundary”. to Google, and Dan Reeves to found his own successful startup Beeminder. up that they wanted to apply for a job — the environment was that great. and of course access to that monster traffic firehose. This was Yahoo! Chris Wilson, Alex, Ingemar, and the absolutely phenomenal Bangalore team. enough and I owe you almost everything. * For history buffs, these were the people at the initial Yahoo! Seung-Taek Park, and Dan Fain. that awestruck look one gets upon seeing alien life for the first time. addition is a genuinely nice person. Best of luck to everyone. Next post: A dream job come true. Congratulations to my academic sibling, friend, and Detroit Red Wings fan Pete Wurman, whose company Kiva Systems just became Amazon’s second largest acquisition ever. By 2006, the robots were real. Pete took me and our shared academic parent, Mike Wellman (who I believe also played an early role in the company), on a tour. Dots on a laptop had become squat orange robots receiving orders, fetching products, avoiding each other, seeking power, and otherwise navigating around a complex environment with computational minds of their own. The designs were inspired: for example, to lift a box, the robot spun underneath it to extend a corkscrew so that the product wouldn’t get jarred. They even added noise in the robots’ paths, so their wheels wouldn’t wear grooves in the floor (call it a floorsaver algorithm). By coincidence, a few weeks ago, I was speaking to someone from Amazon who works on optimizing the way people (ha!) retrieve, store, and pack items in their distribution centers and I mentioned Pete’s company. He said “until that happens” he would focus on optimizing their current systems. Little did we (or at least I) know how quickly “until” would come. Kiva Systems isn’t just an incredibly cool company run by amazing people. It’s a harbinger of things to come as the world moves inexorably toward an Automated Economy. By the way, if you’re worried that robots will take jobs away from people, don’t. The world is a better place with mechanical devices doing mechanical tasks, leaving people to do more interesting and creative things, for example turning crazy ideas into companies. Remember that the purpose of jobs is to produce valuable things and improve the world. Despite political rhetoric, jobs are not an end to themselves. Otherwise, we should all be happy digging ditches and filling them back up, or pumping gas for people who would rather do it themselves. Think about where society should go in fifty or a hundred years when automation can handle more and more tasks. It would be a real shame if at that time people were still “working for a living” in jobs they don’t enjoy simply for the sake of keeping them occupied.